What then is the secret behind New Delhi’s polite yet firm stand? Several factors ranging from India’s better military posture along the contested border to improved economic heft can be cited for the new approach. However, the biggest reason for India to stand up to China ironically is the blatant attempt by President Xi Jinping to force a China-centric order in Asia, a proposition that no government in New Delhi can agree to under any circumstances. Under Narendra Modi, politically the strongest Prime Minister in India for three decades, accepting China’s hegemony was out of the question, given his muscular national security policies. Very early in his tenure Modi had decided to depart from convention on dealing with China. He broke a long standing taboo of not inviting representatives of the Tibetan government-in-exile and that of Taiwan to official functions, lest Beijing feel offended. The Prime Minister of the Tibetan Government-in-exile and Taiwan’s trade representative were among the select invitees to Modi’s oath taking ceremony in the summer of 2014, setting the tone for a more robust policy towards China. A border standoff in Ladakh in September 2014—coinciding with President Xi Jinping’s maiden visit to India—witnessed a rare display of India’s new approach of not succumbing to Chinese bullying. After 1,000 Chinese troops intruded into Chumar, a remote border outpost in South-east Ladakh, New Delhi rapidly built up a 9,000-strong force in two days, forcing the PLA to back off. Another similar face-off at Yangtse in Arunachal Pradesh in 2015 with the same result further demonstrated India’s resolve. India’s indigenously developed missiles—Agni, Akash, and Brahmos—are either ready for induction or already inducted into the armed forces, providing potent weapons for use against China. The development of a family of K-Series of submarine-launched ballistic missiles (SLBM)—although mostly shrouded in secrecy—is in a fairly advanced stage, keeping India on track to complete its nuclear triad. After initial reservation against the proposed Mountain Strike Corps (sanctioned by the previous government), the Modi government has revived its support for the project. Two Mountain Divisions meant for the Strike Corps are about to complete their raising in Northern and Eastern Commands. More air assets are planned for Strike Corps. The eventual aim is to build flexibility in its deployment and allow swift switching of forces from one theatre to another. The formation of a Special Forces Division and a cyber and space agency, as prelude to formation of separate tri-services Special Forces, Cyber and Space Commands, has commenced in recent months. Moreover, Ladakh, the scene of two prominent standoffs in 2013 and 2014, now has an additional infantry brigade stationed permanently in the area while more elements of Northern Command’s reserve division—39—now exercise regularly in the high altitude desert. From the initial induction of a regiment of T-72 tanks done in 2013, India now plans to augment its armor strength to a full-fledged tank brigade in Ladakh. In the East, the 56 and 71 Mountain Divisions, raised from 2009 onwards, are now firmly placed and deployed on the ground, making more troops available to defense planners. The Air Force has also staged forward its assets both in the North and the East by deploying the Sukhoi-30 planes at bases close to the Chinese border. Completion of the project to revamp eight Advanced Landing Grounds (ALGs) in Arunachal Pradesh will mean improved connectivity and increased capacity to insert troops in the high altitude areas. The reported deployment of Brahmos Missile regiments along the northern frontiers in the past couple of years means India now has additional offensive capability. Strategically important roads high in the Himalayas, planned almost a decade ago, are now getting a more focussed attention with more tunnels at high altitude passes being built to allow all-weather traffic. The Indian Navy, the smallest of the three armed forces, is in the midst of an unprecedented expansion, although the strength of its conventional submarine fleet remains a matter of concern. There are of course many weaknesses in India’s higher defense management, its procurement systems, and pace of military modernization. Military leaders have spoken about a high degree of obsolescence across the three forces as a result of years of neglect and apathy in military modernization. The Modi government will have to redouble its efforts to overcome the shortages and restructure the management system of the military expeditiously to meet mounting challenges from China and Pakistan. Overall, however, India’s military strength is right now adequate to hold off any Chinese adventurism across the Himalayas, but not strong enough for an offensive posture. 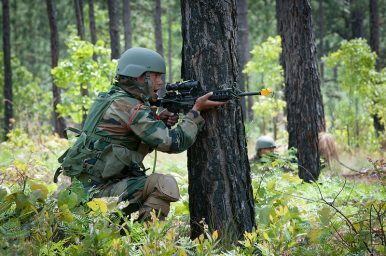 Military analysts however argue that a stronger China will think twice before initiating any conflict with India since Indian soldiers are better trained and battle hardened compared to the PLA troops. That said, neither side will gain anything substantial in a possible armed conflict. That perhaps is the only saving grace in the troubled relationship between India and China at the moment. Nitin A. Gokhale, a veteran strategic affairs analyst, is CEO and Editor-in-Chief of BharatShakti.in, a niche defense website in India.